Peter Hendrickson is director of choral activities at Augsburg College, where he conducts the Augsburg Choir and the Masterworks Chorale. He is also artistic director of Advent Vespers, Augsburg’s annual celebration of the holiday season. A graduate of Augsburg College, Hendrickson studied in West Berlin, at the Hochschule der Künste and the Berliner Kirchenmusikschule, where he took courses in conducting, organ and harpsichord with such noted teachers as Martin Behrmann, Karl Hochreither and Bradford Tracey. He served on the faculties of Macalester College and Columbia University. A frequent guest conductor at festivals, Hendrickson served as artistic director of the American Choir Festival in Leipzig, Germany, and recently conducted the Minnesota Orchestra in several Young People’s concerts. 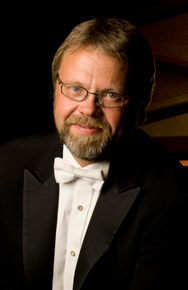 His conducting activities have also included serving as music director for the Warland Symphonic Chorus, assistant conductor of the nationally known Dale Warland Singers, and music director of the Minnetonka Choral Society. For five years he held the post of director of music and organist at Westminster Presbyterian Church in Minneapolis.